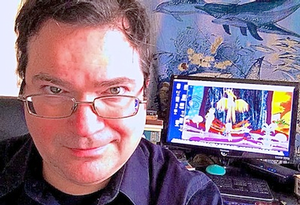 A Composer, Author, Teacher, Artist, Voice Actor, Presenter and Publisher, Kaufman has recently developed projects which put all of these elements together into integrated ‘transmedia productions’ such as his fantasy epic ‘Tales of the Ocean City” and ‘The Musical Forest”. As a composer he has an impressive list of accomplishments including commissions from well-known ensembles, fellowships at arts colonies, arts awards, grants, festivals and performances by world famous musicians. As the founder and director of CHIRON Performing Arts he presented the work of hundreds of artists of all disciplines and produced arts festivals. He has scored films, written for commercials and co-developed a music-based app. After earning his doctorate in music composition from Cornell University Kaufman has, as a teacher, specialized in working with young people. He has worked with ‘challenged youth’, all manner of schools public and private and has maintained a thriving private studio for close to twenty years.